The Navy SEAL who is claiming to have killed Osama Bin Laden during a Fox News documentary later this week has allegedly been identified. 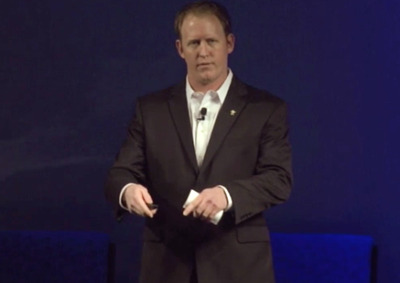 A number of news outlets have reported the Fox interviewee is Robert O’Neill, a 16-year Navy veteran with a decorated service record that includes two Silver Stars, four Bronze Stars, and 52 overall commendations. O’Neill had actually gone public with some of his experiences as a SEAL before this week and lists “speaker” in his Twitter biography. The appeal of O’Neill as a public speaker is obvious. As a SEAL, he’s repeatedly had to embark on highly risky missions that forced him to operate under nearly inhuman levels of pressure. These are the kinds of challenges that most people will never have to face — but O’Neill’s an effective enough speaker to make them seem immediate and applicable even for the vast majority of the population that doesn’t work in military special operations. For instance, O’Neill described the hardest thing about being a Navy SEAL in a video for Leading Authorities Speakers. And it’s something that a lot of people can probably identify with. “I was lucky,” O’Neill says. “But a lot of people weren’t lucky, and I’ve seen it at its worst.” He recalls the children of one of his fallen comrades being consoled by a group of SEALS at their father’s funeral. Those SEALS were themselves killed in a helicopter crash in Afghanistan just a year later. O’Neill is also widely believed to be “the shooter” profiled in a controversial February 2013 article in Esquire Magazine.